A group founded by liberal operative David Brock spoke of the need to force policy changes at Google, Facebook, and YouTube to combat the "proliferation" of "fake news" at the left's largest dark money donor conference, according to an agenda obtained by the Washington Free Beacon. Confidential documents previously obtained by the Free Beacon showed that Media Matters refers to right-leaning news sites when discussing "fake news" and that they had already consulted with a number of social media giants. The Democracy Alliance, a secretive group of deep-pocketed donors who each push hundreds of thousands of dollars to progressive groups approved by the network, held their spring investment conference this week at the five-star InterContinental Buckhead Hotel in Atlanta. Top Democrats such as Terry McAuliffe, who is often floated as a potential 2020 candidate for president, Democratic National Committee Chairman Tom Perez, and billionaire "Need to Impeach" campaign leader Tom Steyer were in attendance. The conference featured a heavy security presence and only members of the Democracy Alliance could enter the hallways where the sessions were being held. Free Beacon reporters, who were on site throughout the gathering, obtained the group's agenda and other documents that shed light on their discussions at the event. Media Matters President Angelo Carusone spoke on the "New Tactics for a New Challenge" panel at the conference where he was joined by Bradley Beychok, the president of American Bridge, another group founded and led by Brock. Carusone spoke to Democracy Alliance members about forcing social media giants to change their policies to combat fake news. "Media Matters President Angelo Carusone will describe the importance of mapping and understanding the fake news ecosystem and how forcing policy changes at Google, Facebook, and YouTube, can prevent the proliferation of fake news and suppressive tactics online in the lead up to the midterms," the event's description reads. While Media Matters did not return a request for comment about what was said on the panel, the Free Beacon obtained confidential documents last year that laid out details on how the group would approach this agenda. Within Brock's agenda, Media Matters said that over the next four years the group would focus on exposing "serial misinformers and right-wing propagandists inhabiting everything from social media to the highest levels of government." The group said that platforms such as Google and Facebook would "no longer uncritically and without consequence host and enrich fake news sites and propagandists" and vowed to "innovate against fake news and propaganda" by using big data analysis and an "early warning system," using predictive technology and collaborating with social media platforms. Media Matters wrote of consulting Facebook on right-leaning media sites. Media Matters said that their map of the "constellation of right-wing Facebook pages that had been the biggest purveyors of fake news" was an example of them helping to educate Facebook. 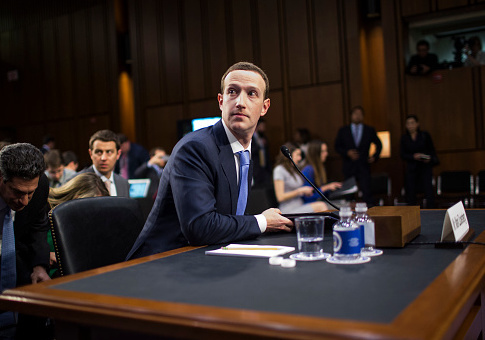 The organization takes credit for getting founder Mark Zuckerberg to commit to fixing the problem and said they had "been engaging with Facebook leadership behind the scenes" to share their expertise and "offer input" on developing solutions. In addition to Facebook, the group wrote that "it was Media Matters that had the information necessary to identify 40 of the worst fake news sites" when Google revised their terms of service in relation to fake news. "Social media platforms need help in identifying vulnerabilities and crafting solutions. To this end, Media Matters will serve as their partner, speaking to them in their language of big data and encouraging changes based on what we see happening in the landscape," they wrote. Brock, who appeared at the Democracy Alliance's fall investment conference at the La Costa Resort in Carlsbad, Calif., was not in Atlanta for the group's spring conference. This entry was posted in Issues and tagged David Brock, Democracy Alliance, Media Matters for America. Bookmark the permalink.